My concert last Sunday, "Opera without Divas", turned out to be one of the more successful events we've had. Bravos, two encores, and my almost losing my pants in mid-concert all contributed to the excitement. 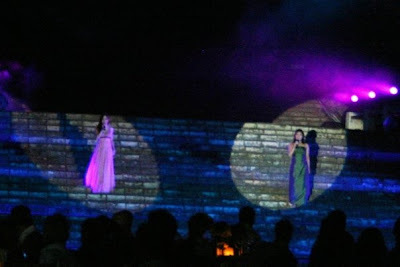 We also sent five of our sexiest young opera stars to Bali for a high-profile "popera" sort of event (pictured below). So, in a very real sense, we're coming up in the world. Then again, there are times when I feel very distant from "reality" ... at least, the former reality. For example, last week I went to pick up a pile of movies at the software pirates' mall. One doesn't ask and they certainly don't tell. My 5 am pre-bedtime movie viewing has been incredibly eclectic, as it is basically whatever one picks up. Last night I popped in some feel-good movie about a single guy adopting a kid. (Second Best was a really searing example of such a film, but this one, by its cover, seemed more in the comedic vein.) So, I'm just sitting around watching the movie and sipping a Diet Coke, and I suddenly think, Wait a minute. I know these people. John Cusack seems to be playing David Gerrold. Not a close friend of mine, but certainly recognizable. And -- heavens -- isn't that movie kid a stunningly accurate portrayal of David's adopted son Dennis? And gee whiz — they even have those names in the movie. I am having a Twilight Zone moment until I suddenly think of looking on the DVD case, where it says that the movie is adapted from a book by David Gerrold. If I had been living in L.A., I would know they were making a movie about the life one of my colleagues in the science fiction community. Everyone I know would know it too.